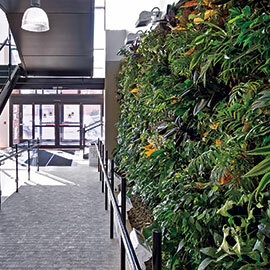 WATERLOO – Since creating its Sustainability Office in 2010, Wilfrid Laurier University has made significant strides in improving its environmental sustainability. Using new design standards to install efficient systems, such as new LED light fixtures, which consume about half the energy of the existing fixtures, in the Science Building on Laurier’s Waterloo campus as well as replacing 10 rooftop air-handling units with more efficient models. Expanding a central waste and recycling program with full-scale recycling and composting capabilities in several buildings on the Waterloo campus and introducing the program on the Brantford campus. Finalizing a campus-wide plastic water bottle phase-out plan and installing three new water refill stations. Redeveloping Mid-campus Drive on the Waterloo campus as a part of an overall transportation demand management plan to make the area safer and more accessible for pedestrians and cyclists and constructing a new secured bike storage area on the Brantford campus. In 2015, Laurier’s Sustainability Office plans to open more outdoor gathering spaces, improve conservation programming in residences through local partnerships, and initiate transportation demand management projects such as electric vehicle charging and bike share stations, which will be informed by surveys on the Waterloo and Brantford campuses.